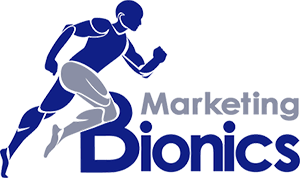 The team at Marketing Bionics has a wealth of experience with all forms of Internet advertising, social media marketing and Web design. We’ve worked with 100’s of clients in all types of markets and leverage our historical data and experience to create cutting edge solutions. As respected members of the online marketing community we continually update our best practices using industry data from many sources. We use this constantly-evolving knowledge to solidify our techniques and develop new solutions that benefit our clients’ campaigns. Our tested, proven methods are always compliant with search engine marketing guidelines and will bring you much better rankings and more targeted traffic. This means that you’ll enjoy positioning as an authoritative resource for your targeted products and services. Regardless of the needs and goals of your company, our team will create a custom solution that will deliver maximum ROI in minimal time. Start driving more leads to your business website by putting our expertise to work for you. With today’s frequently changing climate, it makes sense to have a firm with it’s finger on the pulse of online advertising. Discover how we can help you crush your competition by contacting us for a free website marketing audit today.